PRICES ARE ACTUALIZED BY THE COURSE OF THE RUBLE AT 15.05.2015 (0.45 CPC). PRICES MAY CHANGE. REFINE AT THE BOOKING. 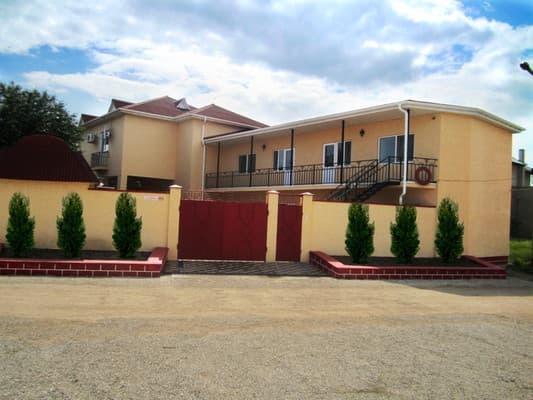 Mini-boarding house "Sunny" is located in the suburbs of the city Feodosia - the village of Beregovoe in the Golden Beach zone, 100 m from the sandy beach of the sea. Hotel "Sunny" - this is a new two-story building with 14 rooms with a total capacity of 35-40 people. Cozy comfortable rooms with modern furniture, beds with orthopedic mattresses. In each of the rooms there are: air conditioning, TV, a combined bathroom, hot and cold water. Free Wi-Fi, parking, small children's playground, gazebos, BBQ. On site, there is a dining room where you can have a delicious meal. Rest in the boarding house "Sunny" will fully enjoy the unique beauty of the region and the gentle sea, as well as the opening view of the swan Lake Kuchuk-Adzhigol. Distance to the cities: Simferopol - 110-120 km, Feodosiya - 7 km. 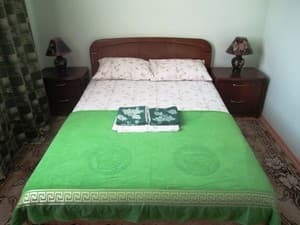 Description of the room: The room is provided with everything necessary for comfortable living: a double bed, a bathroom, a wardrobe. The frequency of cleaning in the room and the change of bed linen - at the request of the client. Description of the room: The room is provided with everything necessary for a comfortable stay. The frequency of cleaning in the room and the change of bed linen - at the request of the client. In the room: single and double bed. 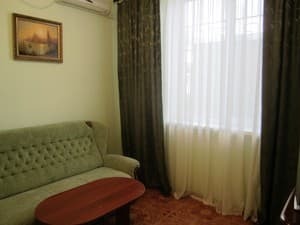 Description of the room: The room is provided with everything necessary for a comfortable stay. The frequency of cleaning in the room and the change of bed linen - at the request of the client. In the room: two single beds and a sofa. 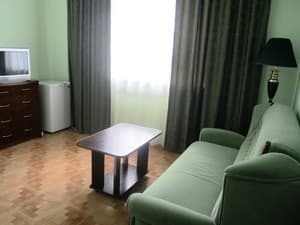 Description of the room: The room is provided with everything necessary for a comfortable stay. The frequency of cleaning in the room and the change of bed linen - at the request of the client. In the room: two double beds, a sofa bed. Wi-fi работает далеко не во всех номерах, приходится выходить в холл или на улицу. Холодильники имеют запах. Так называемое спутниковое ТВ - аш целые 8 каналов. Трансфера гостиничного уже нет. Отваливается металлопластиковая дверь на балкон. Children under 3 years without an extra seat are free. The cost of extra bed is 50% of the cost of living. 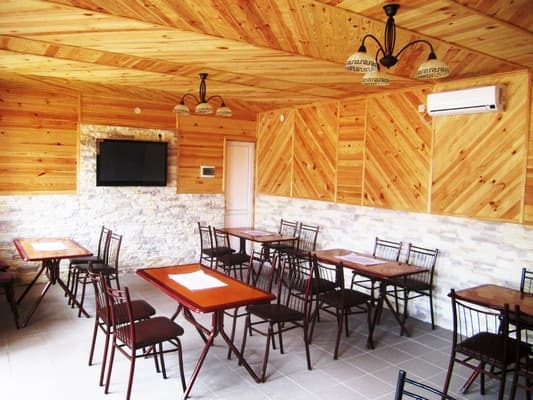 Mini-boarding house "Sunny" is located in the suburb of Feodosia, the village of Beregovoe in the Golden Beach area, 100 meters from the sandy shore of the sea. Distance to the cities: Simferopol - 110-120 km, Feodosiya - 7 km. 1. By railway to the station. Simferopol, then by bus to the bus station of the city of Feodosia and by city transport - a fixed-route taxi №4 to the village of Beregovoe, ost. "Motherland of the world" and address. 2. Railway transport to the station. Aivazovskaya city of Feodosia, then by shuttle bus number 4 to Beregovoe, Ost. "Motherland of the world" and address. Transfer is possible.